As leaders we must keep things in perspective. A recent Facebook post by my daughter rocked my perspective of one thing we take for granted. BREATHING. Hopefully her post about my grand daughter who suffers with Rett Syndrome will shift your perspective on challenges you are facing. Take a breath and think about your perspective… on leadership, life, health and even breathing. Rett causes frequent abnormal breathing that can be very frightening to watch. Kenzie struggles all day long with breath holding and disorganized breathing. We all breathe normally and just take the simple function of breathing for granted. As healthy people, we don’t even think about our breathing. We just breathe. Lately we’ve been worried that she’s also having seizures, which in the Rett world can be easily confused with symptoms of irregular breathing. She’s scheduled for a 72 hour video EEG in mid February. These “mystery episodes” usually occur as Kenzie is waking up. 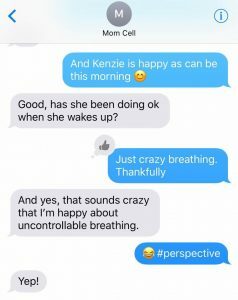 So every morning I’m waiting for the worst (disorganized breathing followed by purple lips, white face, not breathing or responding for about a minute… scary stuff…) Anyway, this text between my mom and I reminded me of the crazy shift in perspective that occurs when your child suffers from the symptoms of Rett. Thankful she just had “crazy disorganized breathing”. Pray for Kenzie as we wait for her EEG and answers concerning these episodes. This is why we desperately fundraise for a cure, so that someday Kenzie can just breathe easily and be free from these horrible symptoms of Rett.